Whether you’re in the early stages of selling your home, or you simply want to improve the overall look of your kitchen, updating your cabinets is often one of the top projects recommended to enhance your home’s attractiveness and value. Unfortunately, replacing your kitchen cabinets with new ones can be prohibitively expensive for many homeowners. The costs can run from as low as $4,000.00 (for generic stock cabinets) to $20,000.00 or more for custom cabinet creation. That’s why many people in the Chandler Kitchen remodeling market look for a cheaper option with the same effect – cabinet refacing. When your kitchen cabinets are refaced, you replace the drawers, drawer fronts, hinges, knobs, pulls and molding with a fresher, cleaner looking design. This sounds like a lot (and it can be), but that is compared to having a Chandler kitchen remodeling company rip all of the cabinets and countertops away and replacing them with entirely new cabinetry. Cabinet refacing by a Chandler kitchen remodeling company will also include covering exposed frames with a thin veneer of real wood or plastic laminate. When done by professionals, a complete kitchen refacing may take two or more days. 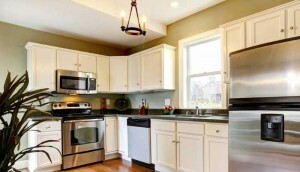 So what are the pros of cabinet refacing with a Chandler kitchen remodeling professional? First, the financial savings are huge. Cabinet refacing costs approximately half the amount of cabinet replacement. It’s also much less of a hassle than tearing cabinets out – and you still have use of your kitchen during the Chandler kitchen remodeling cabinet refacing. It’s also more environmentally friendly, as you’re reusing the primary framework of your cabinets to create a new kitchen look, instead of dumping them in a landfill. When working with a Chandler kitchen remodeling company, there are a couple of cons to consider with kitchen cabinet refacing. Cabinet refacing won’t fix a horrible kitchen design, where there are too few cabinets, too many – or they’re simply poorly placed. To fix that, you will need to carry out a full cabinet replacement. Also, while Chandler kitchen remodeling will try to help guide you, it can be tempting to spend extra on expensive veneers and pricey hardware. Remember – they key here is to save money, and pricier options on the cabinet refacing reduce that savings margin. That being said, there are countless options for your Chandler kitchen remodeling cabinet reface. The veneers needed for refacing are available in a wide range of colors, textures and grains, and you can mix and match to find the right look for your kitchen. You can choose from real wood or plastic laminate veneers. RTFs, or Rigid Thermofoil Doors, feature a hard plastic coating over fiber board, which can be a durable alternative to wood or laminate. Chandler kitchen remodeling offers customized cabinet refacing for every budget and style. ← Design Dilemmas: Will Wood Floors Work in Bathroom Remodels?